Well, I'm not in Germany. I know this because even though the country I'm in (France) has a good team in the World Cup, and even though that team was on the cover of more than a few of the weekend papers and Sunday magazines, no one cares that they scored the tournament's first goal in a win over Nigeria. 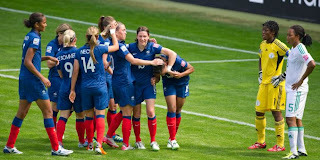 For those who don't know yet, France won with a sweet team goal: Necib sent the ball into box where Thiney moved it quickly to Delie, who controlled and scored. Lanky and graceful, Delie reminds me a little of Berbatov. Nigeria came out at a hundred and ten miles an hour, but were generally much stronger on defense than on attack. Desire Oparanozie broke past Sonia Bompastor and France's back line with a first class run only to blow her chance by sending the ball wide under pressure from GK Sapowitz. What is Oparanozie? 18? Yes, she is. Anyway, when Oparanozie sent that ball wide, I couldn't help but think: a) I don't see Uwak doing that and b) if Uwak was on the field with her, Oparanozie might have had another option. We'll see how this "pray the gay away" coaching strategy works out for Nigeria. I hardly know what to say, as I used to be a Super Falcons fan, and now I have to root against them, because I can't stomach success under these conditions. Basically, the whole story has made it nearly impossible to watch the team's matches and really "see" their game - I'm having trouble getting outside the framework of my anger. They looked so intensely uncomfortable. I have never seen anything quite so painful. At least they were wearing clothes. France played like France. The big difference between this team and the men is that we actually have expectations of them. (The men are famous for lowering our expectations of them.) 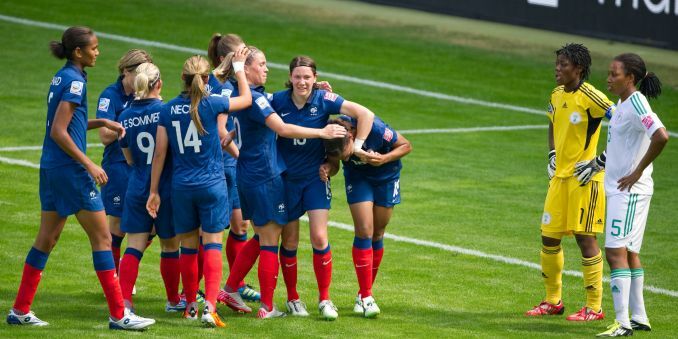 I thought the women were so French they played like Arsenal in the attacking half. They were better at connecting than converting. We'll see. I'm glad they won this one. They had to, to have any chance of getting out of this group. I have only this to say about Germany: a few bloggers noted that Germany seemed rattled when they gave up a goal. This is how Brazil got them in the Olympics. You have to break them early - and then exploit that right away. It's true of course in general (score! score again!). Women's World Cup opening day/games, yet all I see are 'wraps', as if it's too much to put it in a headline over Sanchez/Eto'o/Pastore -to-City rumors.